Dinner was wonderful tonight with this gluten-free Penne pasta dish. It was mixed with a Brown Butter Sage sauce. Sage has a history of being used in folk medicine apart from culinary uses. It is most commonly drunk as a tea, as the herb is good for the nerves, digestive system and for balancing estrogen levels in women. Sage can help calm a fever, and is also natural blood purifier. It can also be useful for aiding the liver for detoxification purposes. Sage is also a natural nerve tonic to relieve a nervous headache. Do you have joint pain, lethargy or a weak digestive system? Sage could be the answer for you. Sage is usually an herb that accompanies chicken, and that is what the sausage is, a chicken sausage mixed with apple and cinnamon. The Penne pasta used in this recipe is a multi-grain gluten-free pasta. The grains include brown rice, quinoa, and amaranth. The quinoa seed is native to Peru, and the amaranth seed is native to Mexico. Quinoa is not a true grain but a seed, and it contains the most protein when compared to any other grain. Both quinoa and amaranth also are great for keeping your blood sugars leveled. Slide a small baking sheet into your oven and preheat it to 400 degrees. Cook gluten-free pasta according to package instructions. Any brand will do. We used De Boles. 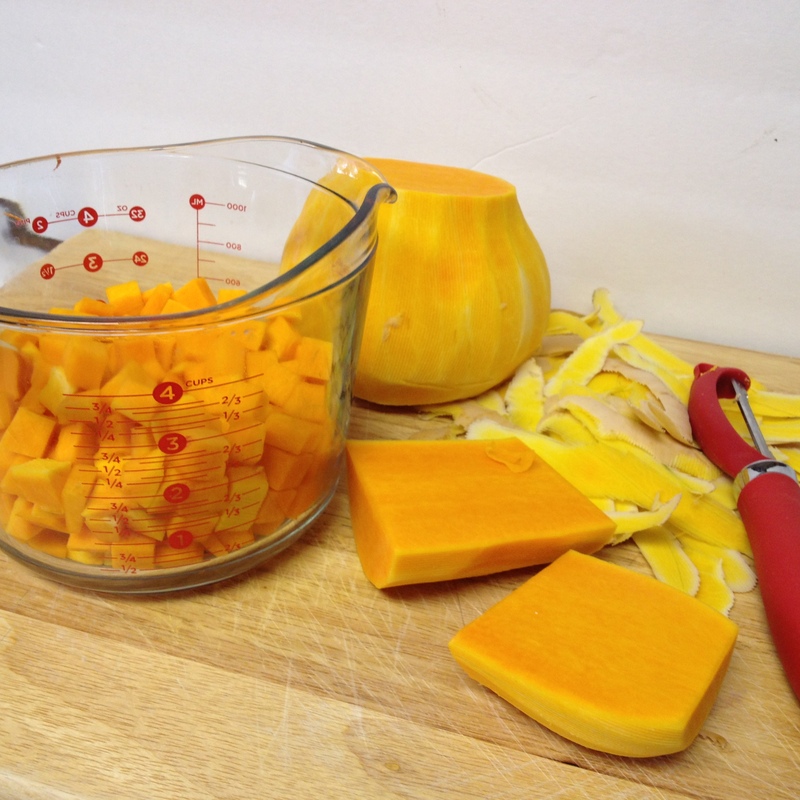 Peel and cube up two cups of butternut squash. In a bowl, toss the squash with olive oil, salt, pepper and dark brown sugar. Remove heated baking sheet from oven, add the squash to the aluminum folded lined hot baking pan and place back into the oven and roast for 20-25 minutes, stirring once during the cooking time. Remove once the squash is tender. In a large medium heated skillet, add olive oil and sear the chicken sausages on all sides. Remove, slice and add back to the pan to cook the centers. 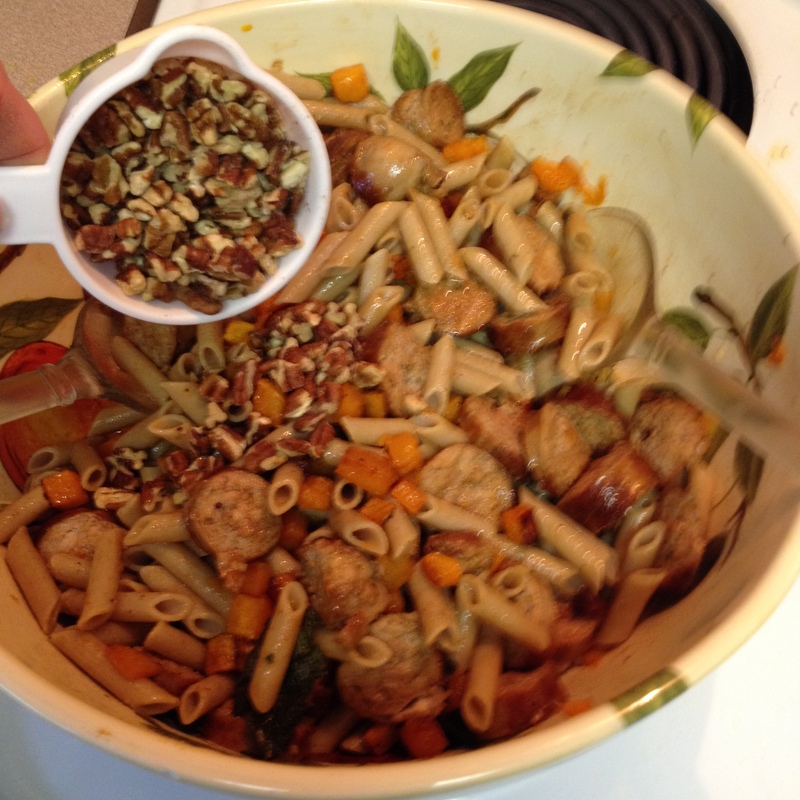 In a large mixing bowl, combine sausage, pasta and butternut squash, and set aside. Heat a 10 inch skillet on medium heat. Place the stick of cold butter into the hot pan, lift and swirl the butter. Add in the sage leaves and keep swirling until the butter has completely melted, should be a deep brown color, but not to the point of burning. After you have poured the brown butter sage sauce over the pasta, toss to mix well. Sprinkle pecan pieces over top and mix in. 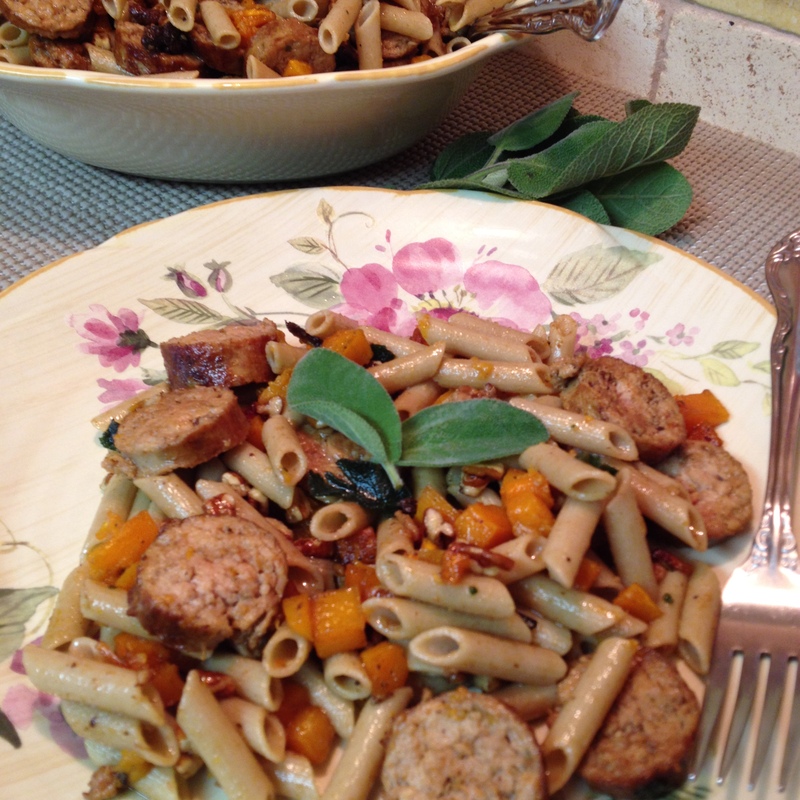 This entry was posted in Chicken, Gluten Free, Main Dish, Videos and tagged Amaranth, Brown Butter Sage Sauce, Butternut squash, Gluten-free diet, Olive oil, Penne, Quinoa, Roasting, Sage, Sausage. Bookmark the permalink. Looks like a delicious meal with lots of interesting ingredients. Yes I thought so when I found the recipe. It was originally made with Orecchiette pasta, which I prepare some pasta meals with. But as you seen I changed it for gluten free Penne pasta. The brown butter sage gives the dish a wonderful flavor. Thanks Jovina for taking the time to stop by and commenting.